Voice over Internet Protocol (VoIP) is now considered the standard for voice communications delivery. Because VoIP allows both voice and data communications over a single network, it can significantly reduce cable and infrastructure costs. Unlike platforms of the past, VoIP platforms support new applications that enable the greater mobility, collaborative solutions, and staff flexibility that businesses need to increase productivity and better serve their clients and employees. As with any major system upgrade, it’s important to complete an assessment and analysis of your current needs and forecast your future expectations. NIS can guide you through the process, helping you select the most appropriate technology and applications, and showing you how to avoid costly mistakes. To get you started, here are five smart strategies for implementing VoIP. While it may be tempting to simply replicate your existing features into a new VoIP system, why settle for old technology? You’ll be investing significant dollars for zero technical advances—not to mention sacrificing productivity. Whether this is your first VoIP system or an upgrade to an existing VoIP system, it’s smart to incorporate innovative technology strategies into the mix. For many companies, this means considering whether a hosted VoIP solution is a good fit. Whether you choose hosted or on-premise, consider consolidating workflows like messaging and scheduling functions within your phone and desktop applications. Features and functionality. This is the bedrock of any RFP process. By crafting a document that can reasonably create a baseline for all responses, the differentiators are easily highlighted and evaluated. Total cost of ownership (TCO). Your analysis should go beyond the initial investment and include the next five years. Maintenance costs and ongoing fees are often less-obvious culprits that push the budget boundaries. Reference checks. No one will hand out a bad reference; so look for the breadth and depth of the vendor’s experience in complex environments. Ask for a reference with challenges and find out how the challenges were addressed. In the same way that a house depends on a foundation to hold up the structure, cabling is the foundation of the network systems that depend on connectivity. 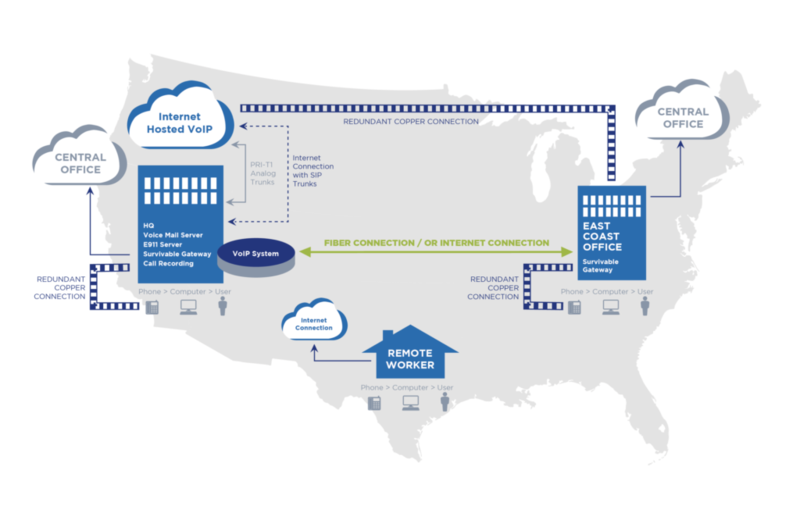 VoIP systems leverage existing data cabling to operate. This typically means power over Ethernet cabling with appropriate bandwidth to support the desired functionality. Voice traffic doesn’t need much, but if you intend to run video conferencing endpoints or use the phone as a switch to your computer, it will be important to ensure proper cabling is in place. One commonly overlooked step in technical projects is the acceptance process. Specifically: How long should you wait and what performance metrics should be satisfied before the final payment is made? Many entities stipulate a retainage between five and ten percent of the total cost of the system. This is very important, as it provides the financial leverage to encourage vendors to address any outstanding issues. Make sure that a punch-list process is part of the acceptance phase. Be sure documents address follow-up responsibilities to which the vendor is contractually bound. install, and maintain a VoIP system can overwhelm existing staff. That’s why engaging the services of a consulting firm that understands the unique technology and options around the VoIP space is often the most efficient and cost effective option. For more than 30 years, NIS has been a fully independent consultant: We have experience with all the leading-edge VoIP options, but do not represent any specific vendor. We will explain all the options and applications available to you, including those you may not have considered. We’ll help you craft a comprehensive RFP, and provide due diligence in reviewing all received responses, to ensure you don’t unknowingly accept a bid from a less qualified vendor. We will always provide you with our unbiased recommendations. As a vendor-independent consultant, our role is not to “sell” you on any particular component, brand, or vendor. Our recommendations are based solely on what’s best for your needs, and that principle guides every step of the consulting process. If you’re thinking about making the move to VoIP, contact us today, and let’s talk. To learn more about VoIP Protocol, download our full white paper.